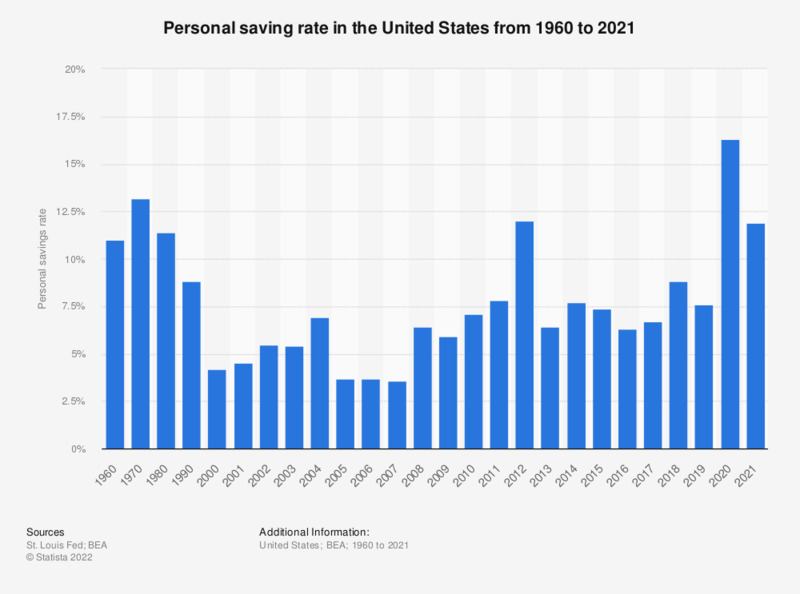 The statistic presents the personal saving rate in the United States from 1960 to 2018, as of December each year. The personal savings rate amounted to 7.6 percent in 2018 in the United States. The saving rate is defined as the ratio of money saved by individuals or families to their disposable income (income after taxes). The value of money put aside depends on a number of factors such as employment conditions, inflation, interest rates and the general state of the economy. In 2007, the personal saving rate in the United States amounted to 3.6 percent and increased to 6.4 percent in 2008, following the outbreak of the global financial crisis. The value of personal savings in the United States increased from 295.4 billion U.S. dollars in 2007, before the crisis, to 657.8 billion U.S. dollars in 2008. In 2018, it amounted to 1.06 trillion U.S. dollars. There are various reasons behind saving. In the short term, money is usually put aside for current expenses or purchases. In the long term, the main reason behind saving might be buying a house, saving for college or saving for retirement. In 2016, 55 percent of U.S. families stated that they were saving money. Some households decide to invest saved money in various financial instruments such as mutual funds, savings bonds or equities. In 2013, 81 percent of American households invested in mutual funds through inside employer-sponsored retirement plans. figures as of December each year. Personal saving rate is calculated as the ratio of personal saving to disposable personal income.